Shedinja in game: 379 Who? Important notice! Pokemon Shedinja is a fictional character of humans. Shedinja (Japanese: ヌケニン Nukenin) is a dual-type Bug/Ghost Pokémon introduced in Generation III. It is considered a "special" evolution of Nincada, appearing only when Nincada evolves into Ninjask, starting at level 20, and there is an extra space in the player's party and the player has an extra regular Poké Ball. An extra Poké Ball is not necessary to obtain Shedinja in Generation III. 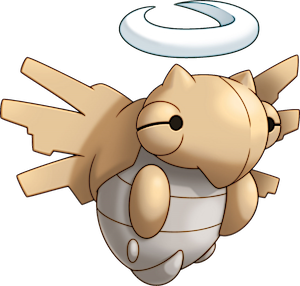 Shedinja is a Pokémon based on a cicada's shed exoskeleton. Most of its body is light brown, but the abdomen is gray. It has four protrusions on its underside instead of legs; the top pair is brown, while the lower is gray. There are round protrusions on the side of its head with narrow slits for eyes. Two lines encircle its abdomen and a white halo floats above its head. On its back is a pair of tattered wings divided into three wingtips. A hole between its wings reveals that its body completely hollow and dark, as it possesses no internal organs. It is said that looking into this empty space will steal one's spirit. Its shell is very hard, which gives it strong defense but renders it incapable of movement. It does not breathe and floats without moving its wings. It lives in forests. 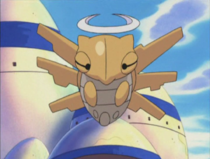 Shedinja made its debut appearance in The Princess and the Togepi under the ownership of Colonel Hansen. It also appeared in A Togepi Mirage!. A Shedinja belonging to a Coordinator competing in the Hoenn Grand Festival made a cameo in Hi Ho Silver Wind! and made its appearance in Deceit and Assist. A Coordinator's Shedinja also appeared in The Saffron Con. A Trainer's Shedinja appeared in A Relay in the Sky!. AG044 Shedinja May's Pokédex Shedinja, the Shed Pokémon. Shedinja possesses a hard, powerful body, giving it strong defenses. Shedinja first appeared when Aqua Admin Amber, having been deprived of his Pokémon after being abandoned by Archie, borrows a Nincada from his comrade Shelly, which then immediately evolves into a Ninjask, putting Wattson in quite a pinch with the incredible speed it gained by the minute. Although the old Gym Leader eventually managed to defeat it, a Shedinja formed from the shell Ninjask shed and attacked him from behind, sending him sinking into the ocean. Several more volumes down the line, both Emerald and Greta used Shedinja to exploit its Wonder Guard Ability, as well as the fact that it has one base HP, requiring no items to resuscitate itself. Shedinja's hard body doesn't move - not even a twitch. In fact, its body appears to be merely a hollow shell. It is believed that this Pokémon will steal the spirit of anyone peering into its hollow body from its back. Shedinja is a peculiar Pokémon. It seems to appear unsought in a Poké Ball after a Nincada evolves. This bizarre Pokémon is entirely immobile - it doesn't even breathe. A peculiar Pokémon that floats in air even though its wings remain completely still. The inside of its body is hollow and utterly dark. A most peculiar Pokémon that somehow appears in a Poké Ball when a Nincada evolves. A discarded bug shell that came to life. Peering into the crack on its back is said to steal one's spirit. A strange Pokémon--it flies without moving its wings, has a hollow shell for a body, and does not breathe. Shedinja’s hard body doesn’t move—not even a twitch. In fact, its body appears to be merely a hollow shell. It is believed that this Pokémon will steal the spirit of anyone peering into its hollow body from its back. Shedinja is a peculiar Pokémon. It seems to appear unsought in a Poké Ball after a Nincada evolves. This bizarre Pokémon is entirely immobile—it doesn’t even breathe. Shedinja can also be damaged by Struggle and any of the Shadow moves from Pokémon Colosseum and Pokémon XD. 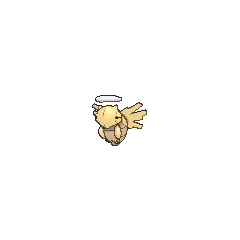 The moves Beat Up, Future Sight, and Doom Desire can hit Shedinja prior to Generation V.
In the Pokémon Mystery Dungeon series, the standard A-button tackle will do one HP damage. In Red Rescue Team and Blue Rescue Team, foe Shedinja always has a maximum of 5 HP, whereas in Explorers of Time, Explorers of Darkness and Explorers of Sky, foe Shedinja always has a maximum of 10 HP. However, as a team member, Shedinja's HP is not capped. Moves marked with a superscript game abbreviation can only be bred onto Shedinja in that game. 51%-100% HP I'm an empty shell, but still I'll fight! 26%-50% HP My health has dipped to around half the peak level. Level up I'm just an empty shell, but I can still level up! Shedinja is difficult to capture because it fades in and out of view. Occasionally erases five of the foe's disruptions on the board. Note: The Poké Ball has to be a regular Poké Ball. Note: In Pokémon Mystery Dungeon: Explorers of Time and Explorers of Darkness, Shedinja will not be mentioned when evolving Nincada, but will subsequently appear in Chimecho's Assembly. 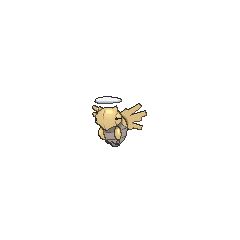 For other sprites and images, please see Shedinja images on the Bulbagarden Archives. From Generation IV onwards, a basic Poké Ball (a requirement for evolution) is removed from the bag upon evolution to produce a Shedinja. In Generation III, Shedinja instead copied the ball Nincada was in; this is the only legitimate way to get a Shedinja in a non-standard Poké Ball. No other Pokémon has the same type combination as Shedinja. Shedinja has the lowest base stat total of all Ghost-type Pokémon, and the lowest base Special Defense of all Ghost-type Pokémon. Shedinja is the only evolved Pokémon that has a lower base stat total than its pre-evolved form. Shedinja is one of only three Pokémon (other than baby Pokémon) to have a different Egg Group than its evolutionary relatives, being in the Mineral Egg Group while Nincada and Ninjask are in the Bug Egg Group. It cannot breed normally with Mineral group Pokémon either way, however, as it has no gender, and it can only breed with Ditto. The other two Pokémon that share this trait are Nidorina and Nidoqueen, which are both in the Undiscovered group. Shedinja inherits the same personality value, IVs, EVs, OT and ID number as the Nincada that shed it. Among other things, due to keeping the same personality value, if the Nincada was Shiny, Shedinja will be Shiny as well. The Shedinja shed from a Nincada has no nickname, and the player is not given an opportunity to nickname it. The only way to give Shedinja a nickname is for the Nincada's original Trainer to take it to a Name Rater. Even if it is affected by Foresight or Odor Sleuth, Shedinja is still immune to Normal and Fighting-type attacks. Shedinja is immune to all one-hit knockout moves, unless a Pokémon with Aerilate uses Guillotine or Horn Drill. If Soak is used to make Shedinja a Water type, it will have immunities to 16 of 18 attack types. Prior to Generation V, if Nincada learns a move upon evolving into Ninjask, Shedinja will also know this move. This means that Shedinja can learn any of Ninjask's level up moves starting at level 20, but only the ones learned at the same level. In Generation V, Shedinja starts with the moves Nincada knew prior to evolution. Shedinja is the only genderless Pokémon that can learn Egg moves (as a Nincada). However, Staryu and Starmie could also learn moves via breeding in Gold and Silver. If the Nincada that the Shedinja evolved from has Pokérus, the Shedinja will have it as well. Even though looking into the crack on Shedinja's back is said to steal one's spirit, all of Shedinja's back sprites display it perfectly, yet no negative effects happen to the player in-game. Shedinja is the only Pokémon in Pokémon Mystery Dungeon: Red Rescue Team and Blue Rescue Team to be able to change its name. In Pokémon Super Mystery Dungeon, wild Shedinja will spawn on any tile where a wild Nincada was defeated after several turns have passed. They move once every two turns and do not attack. Additionally, other wild Pokémon will try to attack the wild Shedinja if they are nearby, allowing them to evolve without defeating the player or their allies if they succeed in causing it to faint. Shedinja is the only Pokémon to have a stat not calculated by the standard formula; if it were, Shedinja would have at least 11 HP even at level 1. Shedinja is the only Pokémon who cannot gain any additional HP EVs. Ironically, Shedinja gives 2 HP EVs when defeated in battle. In Generation VI, EVs in HP can be earned from Super Training, though they have no effect for Shedinja. Having only 1 HP, Shedinja's Defense and Special Defense stats normally have no practical purpose in battle. 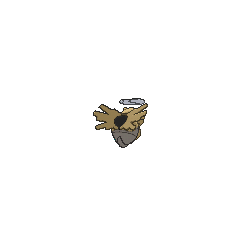 However, if Shedinja receives a substitute through Baton Pass, its Defense and Special Defense are factored into damage the substitute takes. Shedinja's Defense and Special Defense stats also become relevant if a Pokémon uses Transform on it or if Shedinja uses Power Trick (via Mimic). From Generation IV onward, Shedinja is the only Pokémon that can knock itself out from full health with the recoil damage from Struggle. Outside of battle, Shedinja immediately recovers from poison after four steps in Generation IV onwards; in Generation III it will immediately faint after four steps. Despite it being able to learn Substitute and Rest, they will always fail; consequently, the only way Shedinja can have a substitute is via Baton Pass. If Shedinja were to use Curse, it would faint as a result (because Curse always takes at least 1 HP from a Ghost-type user). If Shedinja uses Pain Split (via Mimic), it will cut the target's HP in half, similarly to Super Fang. Shedinja is the only Pokémon that has its HP restored to maximum when leveled up with a Rare Candy (prior to Generation VI) or revived with a Revive. In Generation V onward, if a Shedinja has Sturdy (for example, being hit by Worry Seed followed by Skill Swap with something with Sturdy) it can survive any direct attack and only indirect damage will be able to damage it. It is based on the shed husk that cicadas leave behind when they finish their metamorphosis into adults. Concerning its species' ninja theme, it also appears to be a reference to the fabled ninjutsu technique 空蝉 utsusemi, where a ninja uses a dummy or replica of itself to evade and escape from threats, and where its namesake also alludes to the cast off shed husk of a cicada. It may also be based on a guardian angel, due to the halo-like object floating above its head. Its Ability Wonder Guard probably alludes to this. Shedinja is a combination of shed (to cast off skin or exoskeleton) and ninja. Nukenin is a pun on 抜け忍 nukenin, a term for ninja who have abandoned their clan and lord. It also combines 抜け殻 nukegara (casting off skin) and ninja.